The Brasserie du Marché unfortunately closed in 1971. More than one hundred people lost their jobs, while thousands more lost their favorite beer. In 2005, Adrien Desclée, a young entrepreneur who is as passionate about history as brewing, decided to resurrect Waterloo Beer, with of course the old recipe brown Waterloo, and also blond. The beer quickly became very popular once more in Belgium, and also abroad. In 2013, Desclée met Anthony Martin, owner of the John Martin Group, known for its iconic beers such as Guinness, Gordon and Timmermans. The two decided to join forces and embarked upon a daring challenge: to restore the nobility of Waterloo Beer, from the battlefield to the bar. In 2014, Mont-Saint-Jean farm was acquired by John Martin and a traditional microbrewery was installed there. It was in this farm that the Duke of Wellington established the 'English Hospital' during the Battle of Waterloo – the circle was complete. Today, Waterloo Beer is part of John Martin's prestigious Finest Beer Selection – Martin intends to preserve the flagship beer of Brabant, and promote the art of regional microbreweries, in true appreciation of this original and quality craft beer, which will also serve as a guarantee of its durability and its growing reputation among fans of fine and exclusive beers. 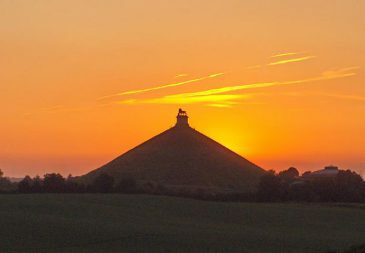 The year 2015 marks the bicentenary of the Battle of Waterloo and will undoubtedly be a year of challenges for Waterloo Beer! 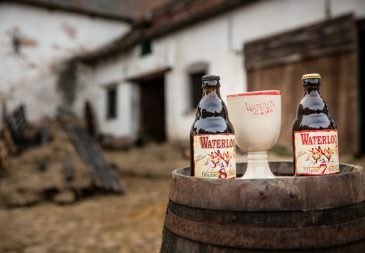 Waterloo Beer is brewed with care and love at the Mont-Saint-Jean farm, which is located on the battlefield of Waterloo. The reputation of this historic site, adjacent to Waterloo, Plancenoit and Braine-l’Alleud, extends well beyond the fighting on 18 June 1815. In 1219, Mont-Saint-Jean was already in the charter of Henry I, which represented a donation by the family of Wasseige Order of Saint John of Jerusalem, later to become the Order of Malta, and whose famous cross has been above the door of the house since 1682. In 1230, the farm came under the command of Commander Arnould. The building was leased from the 14th century onwards, and taken over by the Boucquéau family in a farm lease in 1657. In August 1705, the farm witnessed its first major battle, when the Duke of Marlborough sailed from Mont-Saint-Jean to attack the French army in Overijse. The present building dates from 1719 and was converted to a closed square property in 1765. The site includes a house, stables, piggery, barns, oven, sink, and a chapel. In 1765, the road on which the farm was located (initially in the east) was moved to where it stands today. This important detail would have led Napoleon to attack the poor La Haye Sainte farm in 1815. Major renovations were undertaken in 1778. After the French Revolution, the farm was declared a National Property, only to be acquired by a private owner, Gregory Boucquéau, in 1815. In 1846, the farm was eventually sold to the Claus family of native Flanders farmers. The farm played a key role during the Battle of Waterloo. Indeed, the Duke of Wellington decided to establish a field hospital during the famous 'Duchess of Richmond Ball', which was held on 15 June 1815 in Brussels. During the days that followed, around 6,000 wounded soldiers were treated there, under Deputy Inspector Gunning's control of the Royal Army Medical Corps and his team, hence the name of the English Hospital, Hospital Columbia. British soldiers were not the only ones to be cared for at Mont-Saint-Jean. For four days, doctors and surgeons attended ceaselessly to the many injured and dying. The scene was one of carnage and, according to the evidence, "amputated limbs were piled around the farmyard". The number of victims rose to 63,000 following the four battles that took place between 15-18 June 1815. Prince William of Orange-Nassau was treated there for a shoulder injury before being transferred to Brussels. In 1826, his father, King William I of Netherlands, erected the Lion Mound site in his honour, directly in front of the farm. The Wellington camp aides Colonels Delancey and Gordon, and Gordon's nephew and secretary Lord Fitzroy Somerset, were also treated there. At that time, the available water contained much bacteria. To avoid infection, it was much safer to drink beer. Local breweries provided soldiers with high-fermented beer, such as those is known today under the name of Waterloo Beer, in honour of the Prince of Waterloo, the official title of the Duke of Wellington. Napoleon christened the 'Battle of Mont-Saint-Jean' at the Battle of Waterloo, which ably demonstrated the importance of the Mont-Saint-Jean site. In May 1860, Victor Hugo stayed at the Hotel de Colonnes, which now houses a Carrefour supermarket in Mont-Saint-Jean, and this is where he finished Les Misérables. Threatened with demolition in 1906 and saved at the last moment, the porch of the farmhouse collapsed in 1926. At this time, a tram line ran right outside the building. Threatened again in 1972 by highway construction, part of the farm also collapsed in April 1994. On 24 January 1995 the gatehouse, stables and barn were classified as Historic Monuments. In 1996, the farm was bought by the Janssen family. The latter, supported by the Region Wallonne, carried out extensive renovations in 2012. In 2013, the planned construction of a hotel was approved, but the Janssen family finally decided to sell the property to the John Martin Group brewery in February 2014. The new owner of the Mont-Saint-Jean farm Anthony Martin and his team are faced with a challenge – an emergency plan is under way to save the site. The project is being carried out in collaboration with the architects André Dupont and Associates, who specialize in listed heritage buildings – they were also responsible for restoration of the famous Hougoumont Chateau. The goal is to preserve this historical heritage site, while also boosting visitor numbers – the ambition is for Mont-Saint-Jean farm to become a major tourist attraction. The site already hosts a microbrewery, where Waterloo Beer is brewed. Located around twenty kilometers from Brussels, Waterloo is famous worldwide for being the site of the most famous of Napoleon’s: the Battle of Waterloo. This legendary battle took place on 18 June 1815 and ended with the decisive victory of the allies (British, Germans and Dutch), commanded by the Duke of Wellington, and the Prussians – both opposed the French army, led by Emperor Napoleon 1st. In fact, the fighting did not actually take place at Waterloo, but a little further south, in the territory of the present towns of Lasne, Braine and Genappe. In France, the battle has often been named ‘The Battle of Mont-Saint-Jean’, instead of the more customary title. This battle was the last in which Napoleon took part personally – he had taken control of France during the period known as the Hundred Days War. Despite his desire to continue the fight with reconstituted forces, he was forced, owing to lack of political support, to abdicate four days after his return to Paris. The Battle of Waterloo is considered a major historical event that ended the Napoleonic conquest of Europe, and established the boundaries of the future continent. Today, the Waterloo battlefield is one of Europe’s largest historical sites to have been preserved almost intact. Every year, more than 300,000 visitors from around the world flock there and climb the famous Lion Mound, to see the breadth of the land on which the troops fought so hard. 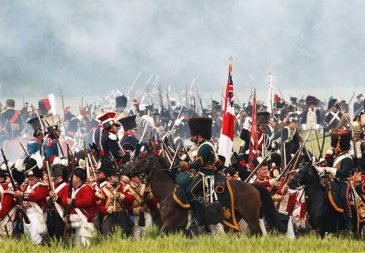 Every year in June, thousands of participants gather at Waterloo to relive the battle. This larger-than-life spectacle is breathtaking for the thousands of spectators who are lucky enough to attend. In 2015, an extensive project, conducted jointly with local authorities, aims to celebrate the bicentennial of the battle. A new underground museum, the renovation of the farm-brewery in Mont-Saint-Jean, a ‘Napoleon Road’ and an unprecedented reenactment bringing together 6,500 actors is likely to attract some 200,000 visitors this summer and then 500,000 visitors every year thereafter.